The Pinotage Club: Pinotage Is Champion!! 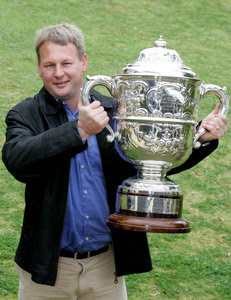 Pinotage from Wamakersvallei won the General Smuts Trophy –- the shows highest honour-- at the 2007 SA Young Wine Awards. It is the first time the Trophy has been won by Pinotage since records began*. Wamakersvallei's wooded 2007 Pinotage was chosen for the award, beating 2026 other wines from 183 contestants. And the wine was also named SA Champion Pinotage. The awards were announced on 23 August. Cellarmaster Hugo Truter (pictured right) received the trophy on behalf of Wamakersvallei. The annual South African Young Wine Show gives winemakers the opportunity to showcase the pick of their current vintage. The Show judges the quality of wines that are still at the beginning of the vinification process - within the year of production - and have some way to go before they are finally blended and bottled in order to recognise the production capabilities of a wine cellar. Very few of the wines are for sale or are in their final form at the time of being judged. *It is part of the Pinotage legend that PK Morkel of Bellevue Estate won the Smuts Trophy in 1959 with Pinotage, an event that shook the Cape wine industry and which led to many farms planting the new variety. However it wasn't until 1987 that the winning variety was also recorded. Prior to then neither the South African National Wine ShowAssociation nor Agri-Expo (the previous organisers of the show) knows with which wines the winning wineries achieved their win.